This, by far, has been our most ambitious project to date: 20 collaborators, 10 different mediums, an outside stimulus and bumping up against different aesthetic approaches, expectations and interpretations. As challenging as the journey has been, the rewards have been deep and remarkably abundant. 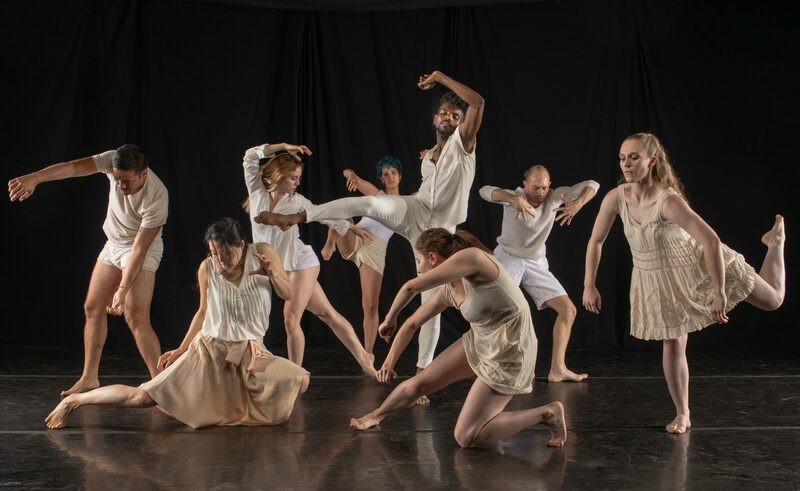 I was approached by Coke Ariail in June of 2017 with the proposition of creating an evening-length, dance-theatre work revolving around a seven canto poem he had written entitled Bamboo Wind. Immediately I heard the voice of my mentor Tere O’Conner, “If you can say it, why is it a dance?” Thus began the struggle of how to interface with the poem rather than take a narrative approach. How to be in dialogue with the spoken words through our movement. Throughout the piece, there are moments where our movement is actually at battle with the words. And in other moments, you will see the dancer’s tap into a personal memory of the sensations described by the canto. In other words, we allowed our relationship to the various cantos to become another presence or being in the dance. That was the moment the dance began to land. This journey has led to many rehearsals where instead of moving, we talked. We questioned. And we rioted until we found a solution. It has created such a deep closeness amongst the dancers and has pulled a clarity about our focus as a company: What we believe in. What we don’t. Who we are inside this container of “us.” What we choose to do about it and how we choose to collectively tackle challenges together ensuring that all voices are heard. Collaboration itself is significant for the divides of style, art form, culture, backgrounds and ethnicity. This project pushed us against our boundaries until we found a new path through it. As an Artistic Director (a.k.a. mama bear) not having control of all of the elements while working with a brand new group of collaborators was enormously daunting. But the challenge has ultimately transformed our approach into greater depths. I am certain that the work the audience is about to see would never have come into being if it were not for these obstacles summoning something new and deeply authentic from us. And the work itself which involves much more than dance, will not simply represent SDW but the collective of artists that collided together to create it. We are humbled and honored by what we have learned from our remarkable collaborators. Throughout our creative process, we have learned that the rabbit hole of communication that once began with a poem and its narrative, had to deepen into interpretation and then several steps further into a personal response – an interface. From there, we began to truly communicate and create. We found new words to articulate our relationship to the music with our beloved composer Robbie Link. In fact, we may have created a new language that would likely be gibberish to the world outside but grounded us to each other. We found new directives to share the journey with our incredible actors Dorothy Brown and Michael Foley while they found their way through turning a monologue into a dialogue and a fantasy of lust into a personal story of longing and desire. In the end, we have all learned a great deal from each other. There are many more stories to share and many more collaborators to celebrate. But for now, we are grateful to Coke for creating an opportunity to come together with artists we would have never known, to create a work that would never have been, and to be so challenged that it strengthened our bond, our commitment and our work. Previous PostPrevious Sold Out Gala!